Eat This. Cut Breast Cancer Risk 50%? Eat a diet rich in cruciferous vegetables--broccoli, kale and cauliflower--and you could cut your risk for breast cancer in half. That's the word from researchers with the Vanderbilt-Ingram Cancer Center and the Shanghai Cancer Institute in China, who have discovered that certain vegetables appear to ward off the devastating disease for some women who are most at risk for it. The study: Led by Dr. Jay Fowke, the team used the Shanghai Cancer Registry to identify 3,035 women who had been diagnosed with breast cancer. Each was closely matched with a woman randomly chosen from the general population. All the women completed food questionnaires, which included detailed information on their consumption of cruciferous vegetables. In China, the most popular cruciferous veggies are Chinese cabbage, bok choi and turnips. 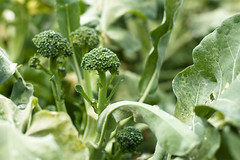 Americans tend to eat more broccoli, kale and cauliflower from the cruciferous vegetable family. The results: While there was only a small positive relationship between a diet high in these vegetables and a reduction in breast cancer risk for the overall study population, there was a striking risk reduction--50 percent--among women with a certain genetic profile. Researchers identified three forms of the GSTP1 genotype among the cancer patients: Ille/Ile, Ile/Val and Val/Val. "Cruciferous vegetables contain some compounds that may have a cancer-inhibitory effect," explained Fowke. "Here we were able to identify a group of women who seem to particularly benefit from a high intake of these vegetables." Why cruciferous vegetables? The Vanderbilt-Ingram researchers focused on them because they contain two chemicals--isothiocyanates and indole-3-carbinol--which may affect carcinogenesis by triggering cell death or by shifting estrogen metabolism. Studies by other researchers have suggested cruciferous vegetables may also reduce the risk of lung, stomach, colorectal and bladder cancers. "We have known for some time that certain foods, like soy foods, appear to interfere with the development of breast cancer because they contain plant estrogens," said Fowke. "The protective effect from cruciferous vegetables in this study was certainly suggestive of a risk reduction, but researchers need to replicate this finding in other studies." The study findings were published in the American Journal of Clinical Nutrition. Cruciferous vegetables such as broccoli have been associated with antioxidant and cellular protection. BroccoMax™ contains a standardized concentration of SGS™ (Sulforaphane Glucosinolate) extracted without solvents from broccoli seeds. SGS™ is metabolized to sulforaphane (isothiocyanate), which is a highly reactive antioxidant. Usage: Take 1 capsule per day with a meal, or as directed by your qualified health care consultant. Keep out of the reach of children. 10 Diet and Exercise Myths--Busted! So THIS Is Why We Have an Appendix! Live Longer If You Eat These 14 Foods? Guess What Fights Bad Breath?